Today, I’m very excited to start a little series here on Needle ‘n Thread that features some Hungarian designs suitable for embroidery and other artistic pursuits. There’s a little background story here about the artist’s legacy, so I’d like to share that with you, along with a pattern that has lots of possibilities for stitching. Erzsébet Baróthi was born on 6 January, 1912, in Budapest, Hungary. She was christened Erzsébet [Elizabeth], but known by the diminutive “Lilly” throughout her life. Her parents were Károly Baróthi (1858-1942), a wealthy businessman and achitect, world traveller, and gifted artist, and his wife, Gizella (née Sztrókay) (1873-1944). In 1938, Lilly married Kálmán Zathureczky (1906-1963), from an aristocratic Hungarian family, and they had two daughters, Piroska, born in 1939, and Pólina, born ca. 1942. In late 1944 or early 1945, Lilly and her two daughters fled from Hungary to a refugee camp in Reggio Emilia (Italy), to escape the ravages of World War II. Lilly’s younger daughter Pólina died as a young child in Reggio Emilia (ca. 1945-1946). Lilly and her older daughter returned to Budapest ca. 1947. In 1947 or 1948, Lilly’s husband escaped from the Communist regime in Hungary, to Austria and subsequently to Canada, settling in Calgary. Lilly and her husband divorced, probably in the 1950’s; he died in 1963, in New York. During the 1956 Hungarian Revolution, Lilly’s daughter Piroska escaped to Austria (and subsequently also came to Canada), but Lilly had decided to remain in Hungary. Lilly died in Budapest in 30 October, 1964, at age 52, after being hit by an automobile. Lilly showed artistic talent by her early teens. Her father travelled widely, and in the early and mid 1930’s, she accompanied him on several trips to parts of Europe and to the Canary Islands. By the early 1930’s, she had also started accumulating a portfolio of graphic designs, mainly for use as embroidery patterns. She also took numerous photographs and did some watercolor paintings. Lilly continued designing even while at the refugee camp in Italy in the mid 1940’s, and once she returned to Budapest, she became a professional graphic artist. After Lilly’s death, her portfolio and related materials were brought out of Hungary by her daughter Piroska, who returned for visits to Budapest in 1966 and 1970. Piroska married Guy Brassard in Canada in 1968, and died of encephalitis in 1974. She was the last descendant of Lilly and of her grandfather (Lilly’s father), Károly Baróthi. Lilly’s portfolio consists of some 50 graphic designs (spanning the years 1931 – 1956) for Hungarian folk embroidery, along with transfers on vellum paper, and a few additional items: stained glass design (1928); painted silk bookmarks (1958); small watercolours (1925, 1956); and photographs (1930’s and 1940’s). Lilly’s designs are quintessential folk embroidery designs, and they would obviously translate very well into the folk embroidery style seen in Hungarian needlework. I’ve reviewed a couple books on Hungarian folk embroidery lately – Nagyanyáink öröksege (Legacy of Our Grandmothers), and Korai Kalocsai Hímzések, both of which can give you a sense of the style and techniques used in Hungarian needlework. When you look at the line drawing of the design, you can see how it is definitely suitable for a wide variety of needlework techniques, and even for other craft uses. The design can be translated into Schwalm embroidery, for example, making use of areas of pulled thread embroidery for filling the different elements of the design. 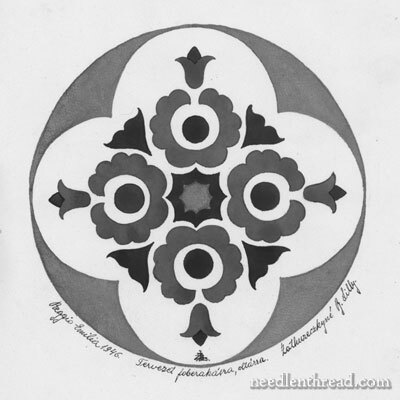 It could be translated into blackwork embroidery. It’s even possible to picture the design worked in gold threads – a little fancier than its original folkishness, but still certainly doable. Other possibilities for use include paper crafts and card-making, toll painting, and wood craft. Hungarian Embroidery Design #1: Lilly’s Legacy – Golden Circle (PDF). The design prints at 5″ x 5″, but it can be enlarged or reduced as desired. I hope you enjoy it! Thanks very much to Guy Brassard and to Mike, for the privilege of sharing Lilly’s Legacy with you! I think it worth pointing out the design you chose to commence with is one of the ones that Lilly made during her stay in the refugee camp in Reggio Emilia. This one was probably intended for use as a doily. Someone who can read the Hungarian script at the bottom may be able to enlighten us more. The small mark at the bottom of the wheel of flowers (on the photo) is her insignia which is a L,B,Z which are cleverly intertwined. what a beautiful design from a beautiful lady. It’s a lovely design, thanks for making it available, Mary. And thanks to Lilly’s decendants for not dismissing these as of no value. I wonder how many wonderful designs ended up in the trash over the years, because the needleworker’s family could not see their value. Thank you for sharing so many beautiful designs and your knowledge. I am always amazed at how much you share and how much you do. Do you realize how amazing you are? You must be very good at time management or you could never do as much as you do. What is quite admirable is that you not only do things professionally, but that you share so much for free. God bless you! I am reminded of the Joni Mitchell song: “For Free.” However, you are not standing in a corner where people dismiss your gift. You are very much in the public eye and have many people who read your articles and benefit from your knowledge. Thanks be to God for that! Thank you! I love the story and that you’re sharing her legacy. Thank you so much for sharing Lilly’s beautiful story. I’m so glad that her family treasured her work to pass it on for future generations. Love the design you posted, it does have all kinds of possibilities. Part of the description says “oltarra” which means for altar … church decoration. 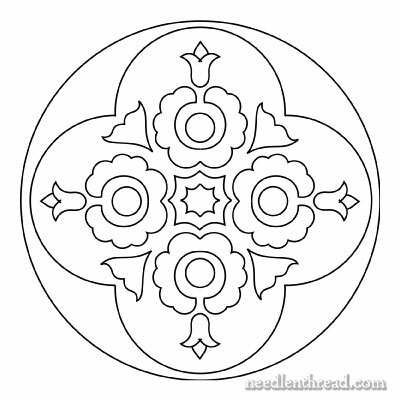 This would also work well for traditional Hungarian wool felt applique and (fine) leather applique. I have a tiny book on the leather applique with beautiful examples, but I can’t put my finger on it right now to give you the title. Thank you, Mary. This was particularly touching because I received my “gift of embroidery” from my own grandmother, who was also born in Budapest. While she was not a graphic designer and came to America to marry when she was in her mid-teens, she was ALWAYS doing handwork. As hard as her life was, you never found a “plain” pillowcase, tablecloth, or doily in her household. I miss her. Thank you for sharing Lily’s story and her pattern. It is indeed wonderful that her family want to share her work. Having been doing a lot of walking just recently along English canals, it’s just dawned on me that this style of design has some similarities with English Canal boat art. Perhaps it is because I have applique on the brain (putting together a class), but that just screams applique to me. So much that I just may have to do it. Now, to decide, go “easy” and do it in the wool felts I’m using for the class, or stretch and do it in some silks. Oh “darn” may have to do some shopping. Thank you so much for this. What a beautiful story. Having a great story behind a design always seems to make the stitching go faster for me, whether its the story of the person you love that you’re making it for, or the story of the design itself. Something to direct the daydreams I suppose. I’ve had folk embroidery on the the brain a lot lately so the timing of the deign was perfect for me. I spent most of yesterday playing with this a bit in wool applique and am already excited about the project. I’m thinking it would be amazing done up in gilded leather applique as well. I was visiting the Ottawa Guild from Vancouver Island on March 16th and enjoyed Mike’s very interesting talk about Lilly and her talents and life. I was also very lucky to see first hand many samples of Lilly’s designs and other Hungarian embroidery. Wow! I am so grateful these designs are going to see the light of day again and I hope people will incorporate them into their embroidery. I’m also very grateful that Mike let us all know about your wonderful web site and blog too. The story of Lilly and her legacy of work is wonderful. As is the fact that her patterns are being shared with everyone to stitch up in the many creative ways we will conceive of. I am particularly attracted to the butterflies pattern on the far right. publishing on your site. I love Lilly’s work and am glad I live in a time to get to see it. She didn’t get to stay with us long enough, nor did her daughters. This is a bold and beautiful design! It is interesting to hear how many of the people commenting on your site are excited to use this design for wool felt applique. I suspect that it was not actually a traditional embroidery design however, but rather one that was created for felt applique. Originally this design was probably inspired by the gorgeous leather applique and embroidery that embellished men’s and women’s leather jackets and cloaks (szurs, and kodmons). FYI, this type of embroidery was the only kind of needle work that was performed exclusively by men! My grandmother, Violet Bartko, was Hungarian and my great sadness is that I never learned how to embroider from her (she died when I was a teenager). At 47, with no needle experience at all I am wondering how to start learning Hungarian embroidery and applique. I inherited so many beautiful pieces from her! I have also been to Hungary twice and collected more wonderful weavings and embroideries (II have quite a collection at this point!). My mission this fall is to find ways to hang them around my home. I just found a stunning piece of Hungarian embroidery that was matted and framed at an antique store in Vermont. I love the way that Hungarians hand their beautifully woven textiles over mirror and picture frames in the home and at church. I am an artist and I have also started to make large gouache paintings of these designs. Hungarian “folk embroidery” is one of my great passions! Thanks for sharing this interesting piece on Lilly. I would like to see more of her designs, is there a book or collection somewhere other than “Legacy of our Grandmother” (which has been hard to find)? I think these design are Italian, it clearly says “Reggio Emilia” under it. Hi, Sarah – Lilly, who was a Hungarian artist, spent time at Reggio Emilia, an Italian refugee camp…. Thank you again Mary, and I just wanted to respond to the last person to submit a comment, Anna-Marya Tompa. 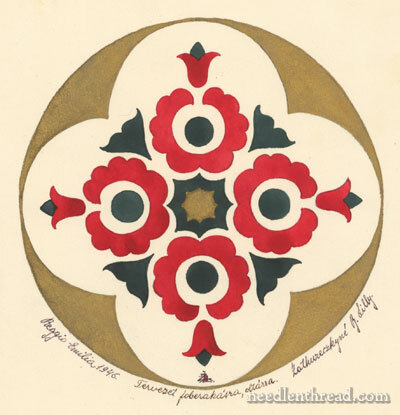 I too am interested in incorporating these beautiful Hungarian designs into my art and photography. I would love to be in touch with you and share ideas if you are interested. I made a few paintings of Hungarian floral embroideries in gouache. I am moving more in the direction of mixed media these days. It would be fun to be in touch. I’d love to learn ore about your interest in Hungarian designs. My grandparents came from Hungary and I inherited some beautiful embroideries and weavings which are the inspiration for my work. I will include my email, and if this is not allowed perhaps Mary could send you my contact info – susiemoon@comcast.net. I have an incredible story about my family (also in Canada) discovering our rich history extending from Hungary. My grandmother discovered her family after many decades, and we have continued to communicate and visit our beautiful family that we have not known all this time. As a brand new cross stitcher, I am anxious to develop my skills so I can make these beautiful designs along with this story to Hungary! Previous Previous post: Satin Stitch Padding – Follow Up Tip! Next Next post: Miniature Embroidery Project Update!